For the next month or so, I'm featuring a variety of different blogging friends and acquaintances in a series of guest posts. Today's guest blogger is Sarah from My Joy-Filled Life. It can be a bit overwhelming when preparing for the arrival of a new baby, especially if it’s your first. 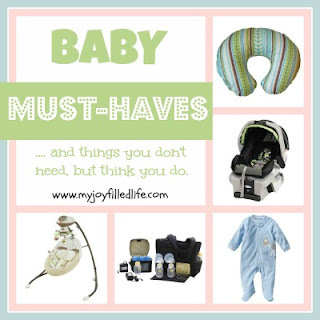 You want to make sure you have everything you need before baby makes its appearance. All the gear, gadgets, clothes, and supplies that are on the baby market can really make your head spin. Do you really need everything on that long list of baby must-haves that the large baby stores suggest? I say no. 1. Car seat – Every baby needs a car seat. It’s the law. They won’t let you leave the hospital without one. I prefer using an infant car seat and then changing to a convertible one when they outgrow the infant one. My favorite infant car seat is the Graco Snugride. I like using an infant car seat because this allows you to keep and carry the baby in the car seat if needed, like at the grocery store or if the baby is sleeping when you get home. Buying an extra base for you infant car seat is handy if you own two cars; that way you can easily put baby in either car. Also, make sure you get a seat that you are able to tighten the straps from the front rather than the back; tightening it from the back is just a pain. 2. Swing – All my babies have loved the swing. The swing is where my babies would sleep the longest. And when you are a mom with a newborn, you need whatever will help your baby sleep so that you can get your sleep too. For us, that was a swing. I like the ones that swing back and forth, and side to side; the one we have used is the Fisher-Price Cradle ‘n Swing. 3. Electric Breastpump – If you are going to breastfeed and plan to pump, you will want a good breast pump. I have used both manual and electric pumps and prefer the electric ones by far. I just don’t feel like the manual ones get the job done and empty out the breast completely. Even if you are going to pump occasionally, I would still recommend an electric one. I currently use the Medela Pump In Style Advanced. This one is a bit pricey, but I love it and it was so worth the money. There are cheaper ones on the market but I don’t know how they compare. I would recommend doing some research and read reviews before you make this purchase. Another option is renting a breastpump; contact your hospital’s lactation consultant or local Le Leche League for information on renting. 4. Nursing Pillow – Another must-have for nursing moms is a nursing pillow. There are several ones on the market; I have used the Boppy Pillow with all my single babies and the Double Blessings Pillow with my twins (a MUST for moms nursing twins). It’s important for a mom to have proper support and comfort while nursing and I feel having a nursing pillow helps with that immensely. 5. Zip-Up Sleepers – My babies live in one-piece sleepers for at least the first three months. No need to worry about lost socks or fiddling around in the middle of the night trying to snap all those snaps properly and in the right order. I love, love, love the Carter’s brand sleepers; they fit true to size, they are good quality, and they are affordable. 6. Nursing Cover – If you are comfortable nursing in public, you will want some kind of nursing cover. After two babies, I realized a blanket just wasn’t cutting it for providing privacy while nursing, especially if you baby is older and constantly pulling it down. There are several brands on the market, or if you are crafty (I am not) you could probably find a pattern and make your own. I love my Bebe au Lait nursing cover; it provides great coverage and allows you to keep an eye on baby without exposing yourself to the world. 1. Baby Bathtub – These things are pretty pricey these days, and high tech! I think it’s just a hassle to get a separate bath tub ready when I can just put a bath cushion in the regular tub and give the baby a quick bath. 2. Diaper Pail – I don’t like having a separate “garbage can” for diapers that just ends up getting stinky even though it claims to keep the smell contained. We throw our pee diapers in the kitchen garbage which gets taken out daily, and we put the poop diapers in a plastic grocery bag and throw them in the garage to go out to the big garbage outside at the end of the day. No more stinky garbages or diaper pails here! 3. Bumbo seat – This thing isn’t cheap! We’ve had one for three (the twins and a singleton) of our babies and they only use them for about 1-2 months tops. Just not worth the money in my opinion. 4. Baby hats – You know the cute little beanie hats? Mine only wear the hospital ones for about a day, but for some reason I continue to buy ones for at home that they never wear! Maybe next time I will resist the urge to buy those cute little things. 5. Changing table – If you are a first time mom, you will most likely have a changing table to match the rest of the furniture in the baby’s new nursery. I had a changing table for the first few babies but no longer have one. A dresser can double as a temporary changing table and we still don’t even use that very often. We just throw down a lap pad and change baby wherever – the floor, the bed, the couch. 6. Cradle/Bassinet – We’ve had both, but barely used either one. My babies just don’t like sleeping in them. They prefer sleeping in a swing, or bouncy seat, or with mommy. It will all depend on what you and baby prefer. Sarah is the JOYful wife of Jorge, the JOYful mother of 7 blessings – ages 2 months – 10 years, and a JOYful servant to the Most High God. She has been JOYfully homeschooling for 6 years using an eclectic approach – a little of this and a little of that. You can find her blogging at My Joy-Filled Life about the joys of big family living, her faith, homeschooling, homemaking, and whatever the Lord lays on her heart. In her free time (what’s that? ), Sarah enjoys baking (but not the clean-up), dabbling in photography, and running. You can also find her on Pinterest and Facebook. Thanks for having me Shay! Congrats on the birth of your little guy! I can't wait to hear all about your home birth!! Thanks for sharing these wonderful lists for babies and mother. I am linking up next to you over at The Better Mom. The boppy and nursing covers are on my must have list as well...I even tell non nursing moms that the boppy is great for lounging and support when baby is learning to sit too...we LOVED our boppy! And the changing table is on my 'don't need' list too...but we still got one! Ha! If nothing else, it's good for storage in the nursery, but we mostly just changed wherever was most convenient with my son...and walking upstairs to the nursery...not convenient!! Well, I do love my Bumbo seat. It's not too expensive when it gets passed down. I carry mine to church so baby can sit with me, and I also used it as a portable high chair when visiting hotels, or homes without young babies. Oh...and I definitely agree with the zip-up sleepers. I hate fiddling with snaps in the middle of the night, and I always found infant sleeping gowns to be awkward! I love reading lists like these. It always amuses me to see how much we are alike or different. We agree on the Bumbo, pack n play/bassinet, and everything on your must have list except the nursing cover since I preferred to use Aden and Anais swaddling blankets as a cover. Oh and I am your newest follower as well. I look forward to reading more. I enjoyed reading this list. I think the bouncy seat is a must have in our home. I prefer using a changing table, but could do without it if needed. We use our bumbo chair for our older kids during Bible time. It helps them have a designated spot to sit, while they are learning to sit quietly and independently. Great List - the more children we added, the less STUFF we needed! I would add infant gowns and onesies to the zip-up-sleepers, love these for newborns who are still all curled up in a ball. I used a swing for only a couple of mine, but did have a bouncy-seat for my last 4, which was wonderful! and after about 4 months, the saucer was a life-saver. gave my little ones a new outlook on life. These are must have’s, rectal ther. is it the best for infants, a pretty burp cloth, really, a recieving blanket workes fine and cheaper. Nursing pillow really, how about just holding you baby in your arms or laying down on the bed. A baby carrier? hold your child.. a nose sucker, ok, l can see that one just because they can’t blow there noses and you can only wipe so much off.. The hammock cradle you baby in your arms till they are sleeping and then put them down. If you put them in that thing after so long you won’t be able to get them to sleep in there crib and you’ll be sorry. Rememeber what your Mothers always said, listen to the older people, we no and have been there and done it.